Enter to win a personalized signed copy of Johnny Green and the Little Green Man by author Suzan Tyler Decker—a delightful fairytale that teaches the values of the environmental movement through a rather peculiar experience of a young boy. Don’t forget that a valid e-mail address is a must. Shipping Guidelines: This book promotion is open to participants with a United States or Canadian mailing address only. The contest will run April 15, 2010 – May 3, 2010, with the winners being drawn May 4, 2010. Administrator’s computer is the official time keeping device for the Giveaway. The winner will be picked at random using a random sequence generator (your comments are numbered in the order they are received and the numbers are like raffle tickets drawn from a hat). Winners have 72hrs to claim their prize. Unclaimed prizes will be awarded to an alternate winner. Disclaimer: The book will be shipped directly from the author (sponsor), delivery of the giveaway item lies solely on the sponsor. Name, e-mail address and physical address of the winner will be shared with the sponsor for the purpose of fulfillment of the giveaway. About the Author: Suzan Tyler Decker and her husband live in Southwest Virginia surrounded by mountains and a beautiful lake. Her husband manages trash and recycling for the City of Roanoke, VA and they actively recycle at home. Decker believes that children eat up the unbelievable and will remember a good story all their lives. Her hope is that this story will encourage both children and adults to make a conscious decision of what can be recycled in their homes, schools and places of business and help keep our earth a cleaner and greener place to live. 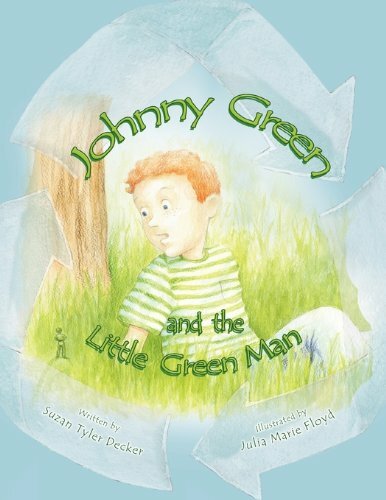 Decker, along with her illustrator, Julia M. Floyd, have given life to Johnny Green and the Little Green Man. what a cute looking book! very cute book. my daughter would benefit from this. I think it looks like a cute book with a great messsage. I’d love to win this for my grandchildren! Thank you for the giveaway! Very nice book! The kids would love it. Thanks for the chance. This book would be a great addition to my daughters school library! What a wonderful book about recycling! I would love to have this book for my grandson as it seems to be in terms that he would understand. We can never start them too early. This sounds like a great book for my science teachers to use! I think my niece would love this book! Thanks! I am always on the look-out for new books to read to my daughter and this one seems to have a very good message for her, especially since we just had Earth Day and she learned all about the importance of helping the Earth to thrive. Love that you have done the giveaway so long!